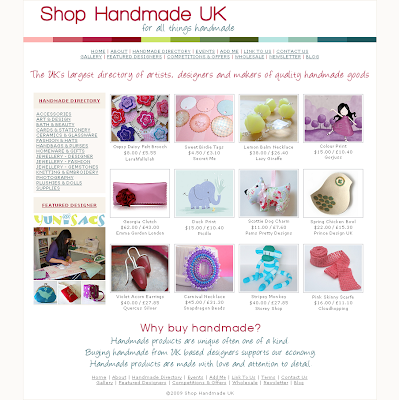 I've been busy with a few new changes to www.shophandmade.co.uk all to help shoppers find your stores and promote us handmakers better. New Homepage Layout - I've moved the product features over to allow a Handmade Directory shortcut. The aim of this is to show instantly what's on offer and to encourage shoppers to browse all the categories and increase traffic to our stores. Under the Handmade Directory shortcut is a link to the Featured Designer so you can see at a glance when this is updated. Our next Featured Designer will be live on Monday so check back for that. New Handmade Directory Layout - In line with the Handmade Directory shortcut on the homepage I've shortened some of the category names and added a brief overview of the type of products found in each category. This should help shoppers find what they are looking for faster. New Wholesale Page - Some time back I removed the wholesale column from each category as many listed as unknown and I felt this would serve only to frustrate trade buyers. I have now included all stores who have listed themselves as offering wholesale, on a dedicated Wholesale page. This lists all the categories alphabetically so store owners and retail buyers can do their shopping from the one page saving them time. Looks absolutely fantastic Belinda. Good work! All your hard works paying off, it looks brilliant! Thanks so much Lorrie & Amanda, appreciate it.